Limni Pier is a relic of Limni Mine, and was built to aid the transport of minerals from the pit face. Now it is home to occasional fishermen and swimmers. 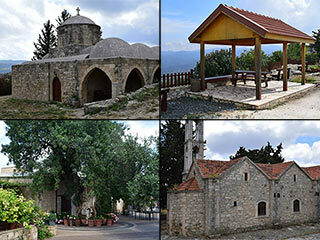 If you walk to the end of the pier there are some spectacular views of both the Polis shoreline and Paphos Forest. You can also see the burnt area above Argaka, which looks strangely beautiful in the sun. You can jump off the end of the pier to cool down. The water is quite deep, and your ears will tell you if you swim to the sandy bottom. There are an assortment of ladders to help you get back on to the pier. The ones at the side are quite slippery but fun for the more adventurous. The ones attached to the main body of the pier are more substantial and easier to use, though they were undergoing maintenance the last time I checked. You can also swim to the shore. However, if you do that, go slightly wide of the pier, as there are slimy rocks directly below the pier which make leaving the sea a bit hazardous. The mosque in Vrestia is well maintained, considering it hasn't been used for over 50 years. A sad monument to the trouble recent history of Cyprus, it stands amid the ruins of this once vibrant village, with only horses and donkeys to keep it company. We are not a family of skiers, so we prefer the toboggan run. Fortunately there is one right next to the Sun Valley Ski Slope. Ayia Napa Sculpture Park should be an essential part of any trip to Ayia Napa. Free to enter, you can spend hours wandering down the statue-lined paths that make up this magnificent work of art. 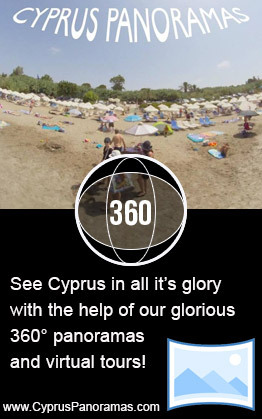 At Cyprus Panoramas our goal is to show you how beautiful and interesting Cyprus is, in 360° panoramas. 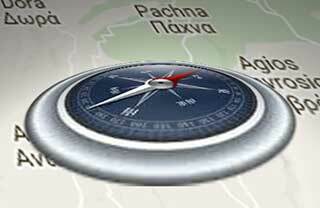 Second, we want to show you how affordable it is to incorporate 360° photography into your own site or social content.